If you're comfortable with hi-tech pads and an all-in-one solution from one of the big brands, then maybe the Prestige is not for you. But if you love the idea of an electronic kit that mirrors the sizes and feel of a standard set for live and studio use, or even as a thoroughly rewarding practice tool, you'd be well-advised to give it a go. Mirrors the sizes and feel of a standard kit. Great for live, studio and practice use. It's ironic, isn't it? The better and more complex electronic drum set technology gets, the closer we get to being able to enjoy the simplest of joys - really good acoustic drum emulations. Of course, in technological terms these 'simplest' sounds are the hardest to recreate; the complexities of tonal nuance and response have been testing engineers' talents for years. But they're getting there - the current crop of the best modules provide fabulously playable acoustic kits. "We were really surprised by the way we took to the physical sensation of playing the Jobeky. We didn't expect it to impress us in quite the way it did"
Drummers are, unsurprisingly, wedded to the sound and feel of a 'real' acoustic set-up. So it's predictable that a good number of those who have embraced electronics harbour a desire to access their sounds with something closer to a traditional set-up than is offered by the big hi-tech manufacturers. There's no arguing that Yamaha, Roland et al have done a fantastic job with their kits in recent years; mesh heads, virtual hi-hats and nice bass drums have all improved the playing experience no end. But there's still clear blue water between these sets and the physical feel of traditionally-sized kits. Which is where Jobeky's new Prestige set comes in - a kit with triggers built in for easy hook-up to the module of your choice. Jobeky offers a flexible, custom-built approach, so ranges are less delineated than with bigger outfits. The Prestige line allows punters to choose from a wide array of sizes, finishes, lugs and so on for a very personalised kit; the kit here runs a 13"x5" snare, 12"x10" rack tom, 14"x14" floor tom and 20"x16" kick with a set of Alesis Surge cymbal triggers (12" hats, 14" crash, 16" ride). The drums have birch shells and, were they not replete with resonance-beating foam and trigger assemblies, would function completely as normal. The only giveaways as to their real nature are neat and discreet 1/4" jack sockets, mesh heads and the fact that they're all fairly weighty. The weight is down to the aforementioned damping and trigger set-ups, but it's a price worth paying, because the kit works extremely well. Removing the head of the floor tom (for example) reveals a pair of circular steel plates which sandwich a thick layer of foam to kill acoustic noise, and the trigger is mounted on this platform. It's a much more developed set-up than simply attaching a trigger to an acoustic drum head, and one that pays dividends in use. The diminutive size and slightly brash appearance of the Alesis Surge cymbals at first had me wondering whether they were little more than a stylistic gimmick. In fact, they're a great addition to the kit. 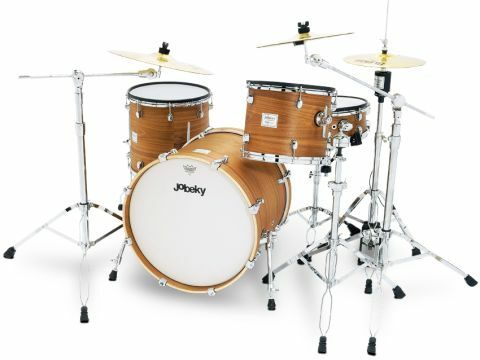 The 'cymbals' are brass, with a clear plastic damping ring installed on their underside; the ring is touch-sensitive to allow for grabbing and choking and, while the hi-hat is a single pad affair, it works very well with Jobeky's own hi-hat controller (which mounts on a standard hi-hat stand). We're a fan of both V-Drum and DTX set-ups. We're very comfortable approaching these hi-tech kits slightly differently than a standard acoustic rig and enjoying them for what they are. Bearing this in mind, we were really surprised by the way we took to the physical sensation of playing the Jobeky. We didn't expect it to impress me in quite the way it did. There's evidently still something about the physical mass of a set of 'proper' sized drums that feels right. Certainly, sitting behind this nicely-proportioned array hooked up to the Roland TD-9 (a favourite module of the moment) that Jobeky sent as its partner was a revelation.